As part of the EU-wide GenTORE project, a survey is conducted with the aim of supporting resilient and efficient cattle production across Europe. We are interested in the opinions of all stakeholders in European cattle systems, at all levels. The combined results of this survey may inform future genetic improvement strategies that are more appropriate for users and stakeholders. We hope you can spare some time to contribute your valuable thoughts to this survey. Introduction to the robustness, animal adaptation and resilience faced with different types of perturbation (e.g. sanitary and nutritional challenges, heat stress and any types of environmental perturbations). State of the art of current problems in breeding programs for different species of farm animals and the influence on production performance: e.g. acidosis in ruminants, diarrhea at weaning for monogastrics, non-controlled environmental perturbations, etc. New technologies of phenotyping: from high throughput omic data at different levels to high frequency data of precision livestock systems. Statistical and mathematical methods for modelling and analysis of phenotyping data; to extract biological meaningful information, especially to quantify the robustness trait. In this part of the course, we explain that the type of data drives the choice of the adequate analysis strategy. Finally, we discuss the possibility for the farmers and breeding companies to apply these robustness indicators. SmartCow Transnational access call is now published! ​SmartCow TNA calls will provide academic and industry communities with free access to a wide range of cattle research facilities across Europe. Overall, they will be able to support up to 30 research projects representing a total of 10.000 "cow-weeks" (number of animals * number of experimental weeks). SmartCow integrates key European cattle research infrastructures to promote their coordinated use and development and thereby help the European cattle sector dace the challenge of sustainable production. Covering all relevant scientific fields and the diversity of cattle types and production systems, SmartCow will provide the academic and private research communities with easy access to high quality services and resources. 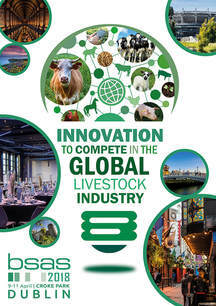 These are needed to develop innovative and ethical solutions for efficient use of animal and feed resources that promote animal welfare and healthy livestock, as well as sustainable competitiveness. GenTORE aims at reaching a wide audience, focusing not only on the more represented systems but also on the less relevant livestock farming environments. 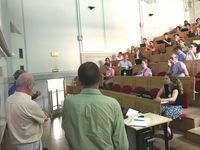 The 1st European Symposium on Livestock Farming in Mountain Areas was an important opportunity for the promotion of GenTORE project. 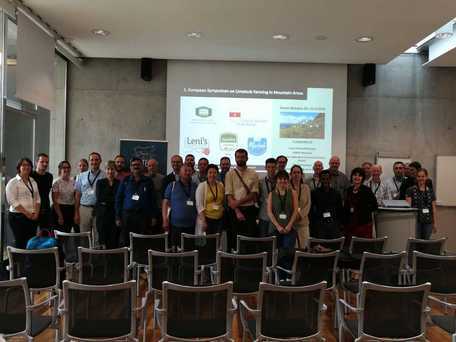 The Symposium took place in Bolzano, from 20th to 22nd June 2018, thanks to the cooperation of the Free University of Bolzano and EURAC Research Center and with the active support of the European Federation of Animal Science (EAAP), the Fibl Institute of Switzerland and the University of Padova. The gathering of participants from different regions across Europe was expected to stimulate the exchange of knowledge, promote innovation and, thus, enable the expertise to be bundled and implemented on a local level throughout Europe. As animal husbandry and breeding were two of the covered topics, GenTORE perfectly fitted the interests of the participants. Prof. Giulio Cozzi, as President of the Italian Society for study and improvement of Alpine livestock systems (SoZooAlp), was one of the co-organizers and during the Symposium had chance to provide information about GenTORE and to hand out project’s informative material. GenTORE will participate in the Precision Livestock Researchers Workshop Seminar organised by the WUR. Claudia Kamphuis will represent GenTORE with her presentation; "Near- and at-market farm technologies to develop proxies for resilience and efficiency". The Seminar will take place 3-4 May 2018. More information about the event and program will be published soon. Together with European projects GplusE, Feed-a-Gene, IMAGE and SAPHIR, GenTORE applied for the Common Dissemination Booster (CDB) last November. The CDB is a new service from the European commission that encourages projects to come together in order to identify a common portfolio of results and shows what the best way is to disseminate project outcomes to the end-users. GplusE, Feed-a-Gene, IMAGE, SAPHIR and GenTORE are all complementary and have common objectives like enhancing the use of genetic collections to develop genomic methodologies in livestock (beef & dairy cattle, pigs and poultry), in order to improve the sustainability, resilience and efficiency of the European Livestock sector and genetic resources. In addition, they have common target audiences as researchers, breeding companies, nutrition companies, farm technology companies, precision farming companies, extension workers, veterinarians, farm managers, processing industry, retailers, policy makers and consumers. GenTORE presents at BSAS 2018! GenTORE project will be participating to BSAS 2018 Conference on 9-11 April in Dublin, Ireland. GenTORE Coordinator Nicolas Friggens will be presenting on "Precision agriculture meets the genomics revolution" on Tuesday 10 April at 9:00. The authors of the presentation are Claudia Kamphuis, Jan Lassen, Sinead McParland and Helene Leclerc (WP3, 4, 5 and 2 Co-Leaders respectively). GenTORE WP6 Leader Eileen Wall will be chairing a session on "Genetics" on Tuesday April 10 between 13:30-15:00 where WP5 Leader Donagh Berry will be presenting on "The genetics of (feed) efficiency in ruminants". GenTORE – “GENomic management Tools to Optimize Resilience and Efficiency” – kicked off not very long ago, in June 2017. Ever since, all 21 project partners were committed to gain more insights in the tricky balance between cattle resilience and efficiency in widely varying environments, while engaging its stakeholders. On 15 & 16 May GenTORE’s project partners will have their first annual meeting to reflect on the results and achievements so far, as well as an opportunity to clarify the expectations for the next year. These annual meetings are also a chance for the 21 project partners from 11 different countries across Europe to meet physically at least once a year, discuss the project’s progress and create a link through GenTORE. We look forward to this event! The SLU is looking for a PhD student for the doctoral project "Modelling and evaluation of future resource-efficient production of meat and milk". The project is linked to GenTORE and another EU-project called "Sustainability of pig production through improved feed efficiency". For more information please visit the website of SLU or take a look at the PDF file. GenTORE presented to the Italian stakeholders! ​Among the strengths of GenTORE there are both the active involvement of the stakeholders and the dissemination of the developments of the projects to end-users since the very beginning. GenTORE, indeed, does not want to be pure researching. At the contrary, it tries to be as close as possible to the practical necessities of the bovine sector. At this aim, the first meeting with the Italian stakeholders took place on November 22nd at the Agripolis campus (Legnaro – PD – Italy). The meeting was organized by the MAPS research team (UniPD) led by Prof. Giulio Cozzi, aiming at illustrating the objectives and the structure of the project. Most of all, the stakeholders were invited to actively participate in GenTORE as their role is considered to be crucial. ​​Some of the most important Breed and Trade Associations were represented (ANAFI, ANARB, ANAPRI, ANABIC, ARAV, AIA, UNICARVE, AZOVE) together with several members of the livestock industrial sector (Consorzio Tutela Formaggio Asiago, INTERMIZOO, NUTRISTAR), which immediately demonstrated a strong interest in the project. A press release has been distributed in Spain exlaining about the GenTORE project and the Spanish partners CITA (Centro de Investigación y Tecnología Agroalimentaria de Aragón) and University of Lleida. You can download the PDF below. Feel free to distribute! ​The presentation was received well and generated discussions about managing large databases and the definition of resilience. It was noted that within GenTORE, the broadest definition of resilience is used; this means that also disease response and recovery are taken into consideration. ​GenTORE researchers Nic Friggens, Lotta Rhydmer, and Roel Veerkamp have been teaching a group of 25 MSc and PhD students, as part of a week-long NOVA-GenTORE PhD course, about genotype-environment interactions, resource allocation, resilience and efficiency viewed from the perspectives of animal breeding and systems biology.